EventAE (Event Analysis and Exploration) is a joint project of the Database System Research Group at Heidelberg University and the Databases and Information Systems Group at Technische Universität Ilmenau. The project is funded by the German Research Foundation (DFG). In this project, we consider an event as something that happens at a given place and time between a group of actors, as originally stated in the Topic Detection and Tracking (TDT) task. To extract events from diverse data sources such as Wikipedia and News outlets, we develop a pipeline consisting of components for document preprocessing, named entity recognition, disambiguation and entity linkage (primarily to Wikidata entries). 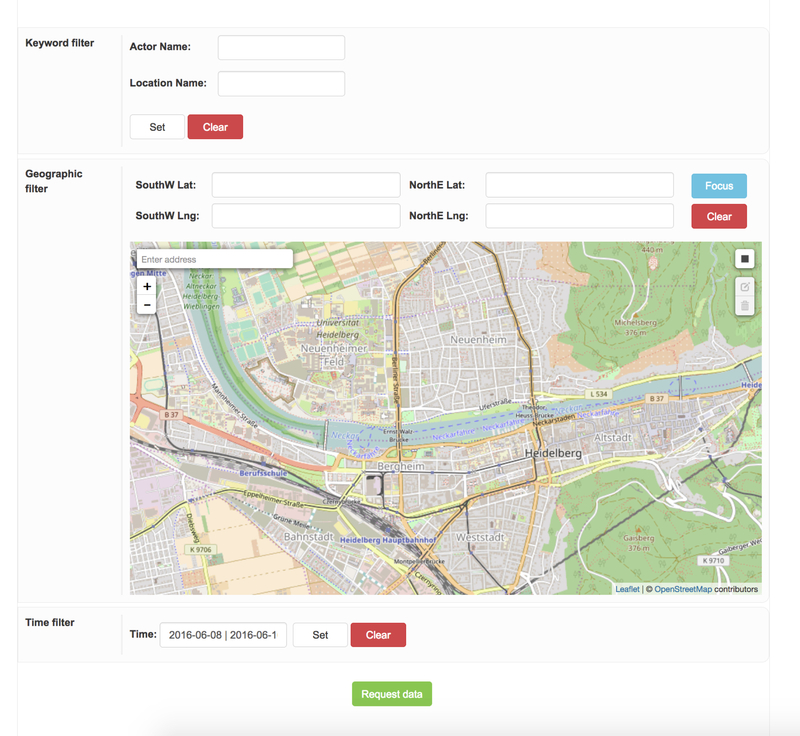 In particular, the pipeline makes use of HeidelTime, a multilingual, cross-domain temporal tagger developed at the Database Systems Research Group at Heidelberg University, and a HeidelPlace, our newly developed framework for geoparsing. In the project, we make several data sets with information about events extracted from Wikipedia (German and English) as well as German and English News outlet readily available to the research community. For more information about the different datasets provided so far (and continuously updated), see here. If you have questions about the project, data sets or tools, please contact Michael Gertz and Kai-Uwe Sattler.